(Newser) – In history books, he was the chief architect of the systematic genocide of 6 million Jews. But in the pages of Germany's Welt am Sonntag newspaper, SS chief Heinrich Himmler is intimately depicted feeding a fawn or strolling with a daughter, and as the author of love letters to his wife, "my sweet, beloved little woman." It's part of an unprecedented trove of personal documents, photos, and even recipe books that belonged to Adolf Hitler's SS chief, being published now for the first time. "There is nothing like it for any other member of the Nazi leadership," says one Nazi expert. Strange, his writings remind me of Hillary except she burned all her evidence. 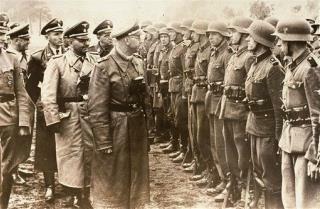 How many Himmler's are working for Obama? They are just following orders, doing the 'right' thing. If anyone thought they'd have all manner of notes cackling about Einsatzgruppen and gassings, they don't know what was going on. This was the crowd that invented plausible deniability, especially for Der Fuhrer. Everything was described as deportation and resettllement. Exact terms were never to be used. Not because they thought the Allies would win, but because they were afraid the German people would find out.